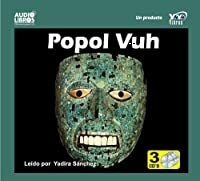 One of the most extraordinary works of the human imagination and the most important text in the native languages of the Americas, Popul Vuh: The Mayan Book of the Dawn of Life was first made accessible to the public 10 years ago. This new edition retains the quality of the original translation, has been enriched, and includes 20 new illustrations, maps, drawings, and photos. okay, this is hard to read, but stick with it and you won't regret it!!! I love epic tales and this one did not disappoint. I really like the stories the Malayan's of 1550(ish) told to explain how man came to be on earth! Brilliant little book, full of culture and an insight into how man always tries to work out where he came from.